Her Majesty, accompanied by members of the Royal Family, was present at The Queen's Birthday Parade on Horse Guards Parade at which The Queen's Colour of the 1st Battalion Welsh Guards was trooped. Click above for an article with video and pictures from the BBC. It was a quiet end of the week for the Queen's actual events (on Thursday she held an investiture, though I saw nothing to give a brooch hint, and took the salute at the Household Division Beating Retreat in the Guards' Badge) but other problems made headlines: someone defaced the Queen's portrait at Westminster Abbey (why couldn't they have picked one of the dodgy portraits to mess with and not such a brilliant one, le sigh) and the Jubilee barge crashed and lost a crown. Oy. Thankfully, Trooping the Colour went well as always (well, except for a slight fainting issue, I guess). The Duke of Kent, the Queen's cousin, rode with her in place of the Duke of Edinburgh - a good solution for both parties, since the DoK had a mild stroke earlier this year and wasn't quite up to such a long period on horseback. For the second year running, they traveled by glass coach instead of a phaeton (open carriage) due to weather concerns. 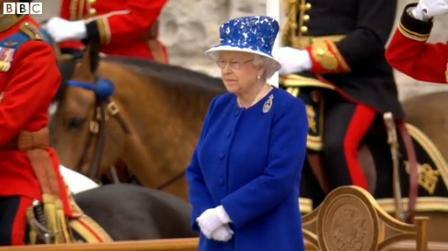 The Queen was lovely in blue and wore the Guards' Badge as her brooch, as she always does. Later, she made a quick clothes switch and donned her trusty Aquamarine Clips for a visit to the DoE at the London Clinic.